Celtic warmed up for their crucial Champions League play-off in midweek with a 4-2 win over St Johnstone at McDiarmid Park after surviving a late lapse. Striker Leigh Griffiths, celebrating his 26th birthday, opened the scoring in the 28th minute with his sixth of the season before forward Scott Sinclair and James Forrest looked to have three Ladbrokes Premiership points secured by the interval. 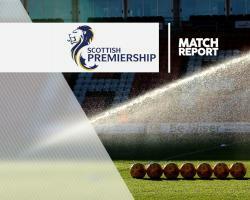 The Scottish champions cruised the second half although in the 82nd-minute Hoops substitute Liam Henderson fouled Danny Swanson to hand the home side a penalty which the Saints midfielder converted before striker Steven MacLean grabbed a second in the 88th minute to give the Perth side some late hope. However, Hoops substitute Ryan Christie fired in from close range in added time to make it 4-2 and put a fairer reflection of the game on the scoreline. Celtic beat Hapoel Be'er Sheva 5-2 in the first leg of their Champions League play-off on Wednesday night and on their first-half performance they can be confident of completing the job in the Turner Stadium although Brendan Rodgers may have some concern about the unnecessary loss of goals. Despite the Hoops' trip to Israel in midweek Rodgers named a strong starting 11. He only made two changes, bringing in defender Saidy Janko and midfielder Nir Bitton for Mikael Lustig and Callum McGregor, the latter starting on the bench. Saints boss Tommy Wright had new signing Richard Foster from Ross County in his reshuffled defence which was without injured Steven Anderson, Tam Scobbie, Dave Mackay and Keith Watson. The visitors were soon into their stride in the Perth sunshine and there were a few close calls before they took the lead. Left-back Kieran Tierney got past Foster and when his cut-back landed at the feet of Griffiths he fired it in off the bar with what looked like the aid of a slight deflection. St Johnstone responded and David Wotherspoon's free-kick was tipped over the bar by Hoops keeper Craig Gordon with Celtic surviving the corner, but that was as much as they offered offensively. Griffiths was then booked by referee Craig Thomson for simulation inside the box as Foster moved in but five minutes from the interval Celtic doubled their lead through Sinclair. Midfielder Tom Rogic's fine pass set up Forrest but his effort was blocked by Saints keeper Alan Mannus who then brilliantly parried Griffiths' follow-up shot, only to see the ball break to Sinclair to knock into the exposed net. In the 44th minute Forrest scarpered from just inside Saints' half and eased past the chasing Paul Paton before confidently knocking the ball it past Mannus, who then had to save a Griffiths free-kick to prevent number four before the break. Rogic hammered a drive off the crossbar early in the second half as the home side continued their dominance without going flat-out and Foster almost headed into his own net. However, Saints were given a lifeline when Henderson, on for Bitton, tripped Swanson inside the box and the Saints player hammered the resultant penalty past Gordon. With two minutes remaining McLean got a touch to Swanson's cross to ensure a nervy last few minutes for the Hoops, which were eased when Christie, on for Forrest, hammered in the fourth.